With Halloween well behind us, the holiday season is quickly approaching. Before we know it, it will be Thanksgiving then Hanukah, Christmas, and New Year’s. Throughout the holiday season, people will be attending holiday parties and shopping for the perfect gifts for their friends and family. Soon women everywhere will be swarming jewelry and retail stores in search of the latest jewelry styles. 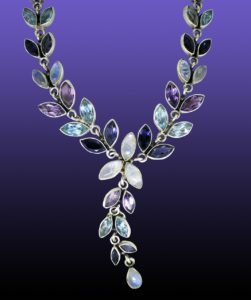 They’ll be seeking the perfect jewelry piece to accentuate their holiday dress or to give as a gift. It’s best to start preparing for the holiday rush as early as possible to ensure your store is fully stocked with this season’s hottest styles. Ch evrons and Pyramids – Bold-shaped jewelry continuously gains popularity. Bold shapes, like chevrons and pyramids, are classic and stylish, so they won’t be going out of style any time soon. These styles have become a signature piece of many upcoming designers, including Anita Ko and Nicole Trunfio. The geometric form of chevron necklaces and triangle shaped earrings pop off an outfit and add drama. The tiny pyramid shape is also popular and can be found on earrings, necklaces, and rings. Whether large or small, these bold shapes can pull together an outfit and create shop-stopping look. Pear Shaped Crystals – Pear shaped or teardrop crystals are elegant and refined. They can be found on all kinds of jewelry, from earrings and rings to necklaces and bracelets. They can also be worn as a pendant on a necklace. Pear shaped crystal pieces are best worn for formal occasions, yet they can still be worn for more casual affairs. When worn with an evening gown or cocktail dress, they make women look and feel like royalty. Chunky Chains – Chucky chains are thick chains that can be either short or long. They can be worn to spruce up an ordinary outfit like jeans and a sweater, or be used to embellish the little black dress found in every woman’s closet. They also work well with all types of neck-lines, including straight-neck, scoop-neck, and V-neck. The best way to pull off a chucky chain is by pairing it with a simple ensemble. 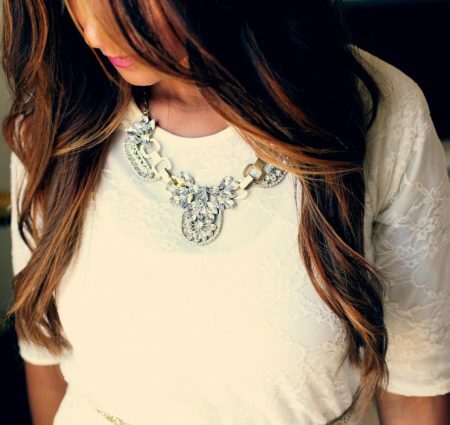 With a solid color top or dress, the jewelry will pop and be the focal point of the outfit. Cuff Bracelets – Cuff bracelets are the perfect statement piece. Rather than sitting snug on the wrist, cuff bracelets are looser, leaving a gap between the bracelet and the wrist. Unlike bangles that are fully enclosed, cuff bracelets have a small opening and are worn low on the wrist bone. The best way to show them off is by wearing them on over the bare skin or over a slim fit, solid-colored long sleeve shirt or dress. To ensure your store is fully stocked with this season’s hottest trends, contact Olympia Gold. Our production staff has a deep understanding of the market and is knowledgeable about the latest styles. We provide the highest quality layered gold and silver wholesale jewelry and fashion jewelry.